As a child, I wanted to be a car designer. 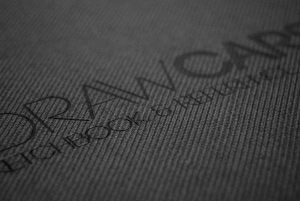 So, for me, it was an acceptable gift what I saw a couple of weeks ago on the internet: “I DRAW CARS sketchbook and reference guide is an indispensible tool for students, designers, hobbyists, artists and car enthusiasts.“ I made my subscription and ever since, I made nearly 50 car drawings and used „the templates to develop (my) personal style, use(d) the pages as mood boards and paste(d) inspirational images, or just use(d) the pages to flesh out a concept“, how it is described on the home page. Please don’t let me distract you, I finally have become an architect and I’m not talking from the car designer's point of view. I walk through the streets and usually draw existing cars on-site (like I do when I draw architecture), but sometimes I fall back into old patterns and make an attempt as a car designer, again. The book is devided into four sections. Section 1 tells us a lot about the background of automobile industry, for example where you can study car and transportation design or which references the authors used when they created the book. At this point I would require a little chapter containing the work of the creators, Matt Marrocco and Adam Hubers, what they like about car design or what are their favourite cars in the history of automotive design. 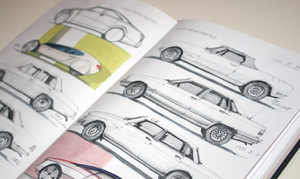 Even an additional chapter or section about the icons of car design would be informative, instructional and inspiring. Section 2 provides us an insight into proportion of cars which is very important. 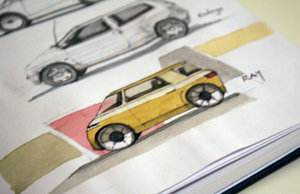 On the basis of a hatchback (compact car) side view, the creators develop a rule for correct proportions in six steps. Pages like these are a real eye-opener. The description is easy to understand and comprehensible. Further on, a huge list of car classifications describes the different sizes and models of cars. Nine of these car classifications are succeeded immediately after the proportion chapter. A bigger amount of car classifications would be more diversifying, but with less pages of each classification or segment. What I miss most here is front and rear practice pages of car elevations to encourage my proportion skills not only in the side view. In the first section of the book, a rear and front view of a car is shown, where the anatomy of an automobile is very well illustrated: the work seems to be done already. Ideally, a front, side and rear view would be on one page and on one level. In my humble opinion, section 3 and 4, perspective and advanced perspective could be integrated into one section. Some more day-to-day perspective proposals, as we see the cars in the streets or at a car show, would claim for a more realistic use. In exchange, an additional section could be quite useful to answer the following questions: Which pens should I use? How can I add colour? How can I add shadows and highlights (described only shortly in section 2)? What are special designer obsessions? The book is well manufactured with a nice haptic quality at that price (24.99$). The surface paper has a solid contact with pencils, pens and the provided biro. It takes even water colour and copic markers. 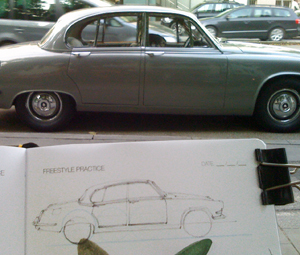 For people who are not already in the car design metier (like me) or who are studying car design, the IDRAWCARS sketchbook & reference guide is an fascinating beginning. It is sold out at the moment, but I think Marrocco and Hubers are working on a new circulation, and even a revised version could be possible with little modifications.